The average cost for a ductless air conditioning system installation for a 2000 square foot home is between $3,000 to $8,000. The price depends on the area in which you live, as well as the amount of units you’ll need, which depends on the size of your home. Typically manufacturers recommend installing one unit per room and just one outside ductless condenser AC unit. The average cost of a single ductless air conditioner would be $1800. The size of your home and its energy efficiency affect the number of ductless AC units you will need. Keep in mind that projects like adding insulation to your attic, closing off leaks around doors and windows, and adding a low-emissivity film to your windows can make the job much easier for your ductless air conditioner. 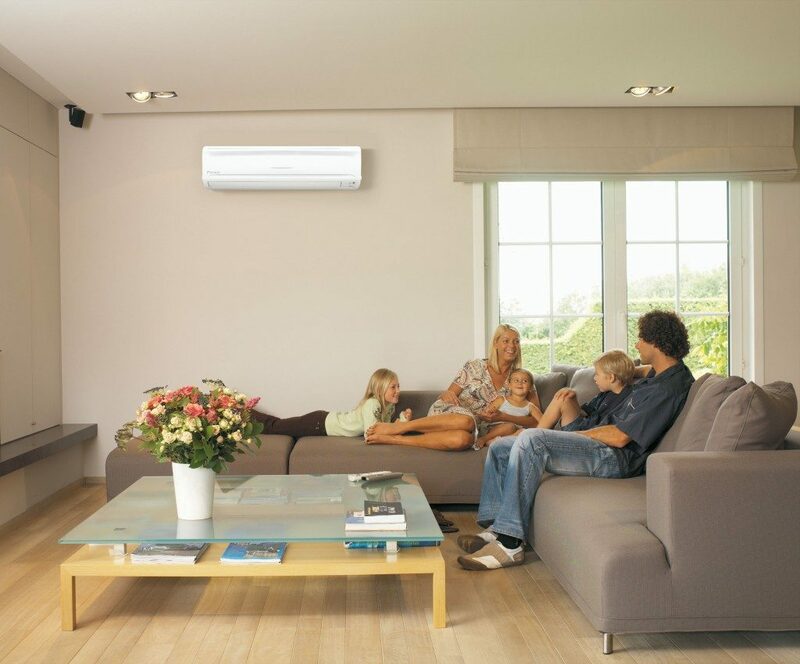 Read more about ductless heat pump cost here. Comfort and energy efficiency are the biggest advantages of mini-split systems. But if yours is installed incorrectly or isn’t the right size, you won’t experience either of those benefits. Unless you are a builder or remodeler, it’s worth hiring a ductless air conditioner contractor with the right tools in their belt. The contractor has to lay concrete for the outdoor unit, cut a hole in the exterior wall, run the electrical lines for the conduit, and perform other tasks as needed, such as getting rid of some of your current system’s components. Expect to pay between $1300 and $2000. While you may be tempted to settle for the best price regardless of specific experience, remember that ductless heating and cooling systems are still a niche market in the U.S. You may have to hunt a little for the right contractor, so don’t settle for someone you’re not sure will do a good job just because they offer the best price. If you live somewhere with extreme summer temperatures, a ductless air conditioner may not be able to bear the entire burden of cooling your home on the hottest days. You may want to hold onto your traditional HVAC system to use as a supplement when needed. If you have wall units or radiant heating, you can integrate just one ductless system to take care of your main living area or “zone,” rather than switching to ductless in your whole house. There may be rebates and tax incentives available to you, so check them out before you red or green-light this project. A ductless air conditioner system works by having a condenser outside that pumps and cools refrigerant through copper lines that lead to an indoor air unit that distributes the cool air with a fan. That’s similar to central air (check central air conditioning costs). Ductless AC systems have one or more interior air handlers that can provide cooling to separate zones, allowing you to activate one or multiple air units at once. This provides you with great flexibility, since you can choose the areas you want to cool with ductless HVAC, and you can also set different rooms of your home to different temperatures. The number of zones your home will need depends on its layout, size, the amount of daily use, and your budget. There are two types of ductless systems. The first is a split ductless air conditioner system, which consists of one compressor and one air conditioner outlet, and is meant for cooling one room of the home. 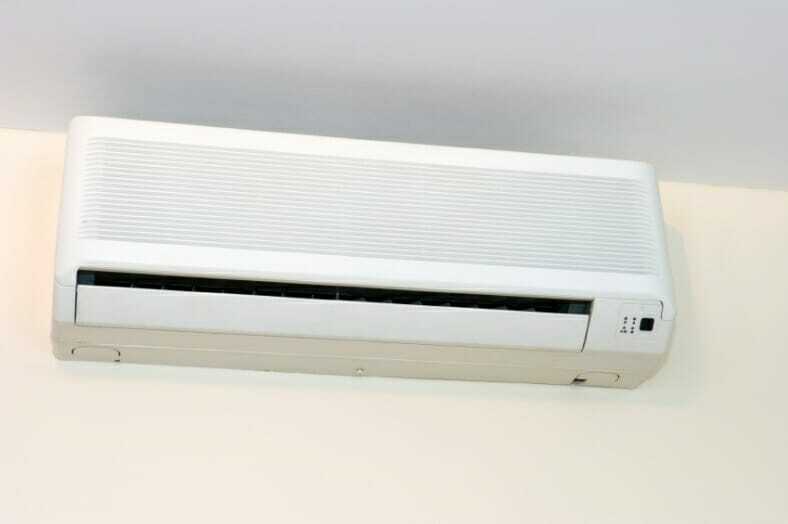 On the other hand, a multi-split air conditioner system has one outdoor HVAC unit that connects to as many as five indoor ductless air units, often mounted on interior walls as seen below. The main difference between a ductless air conditioning and central air conditioning system is that central AC pumps cooled air into the home via ducts in your walls or attic. Because the air has to travel through your ducts before it’s cooled, some of the air is lost in the unconditioned areas of your home. This results in a less efficient system overall, which can result in higher utility bills. A major benefit of ductless AC is the cost savings. 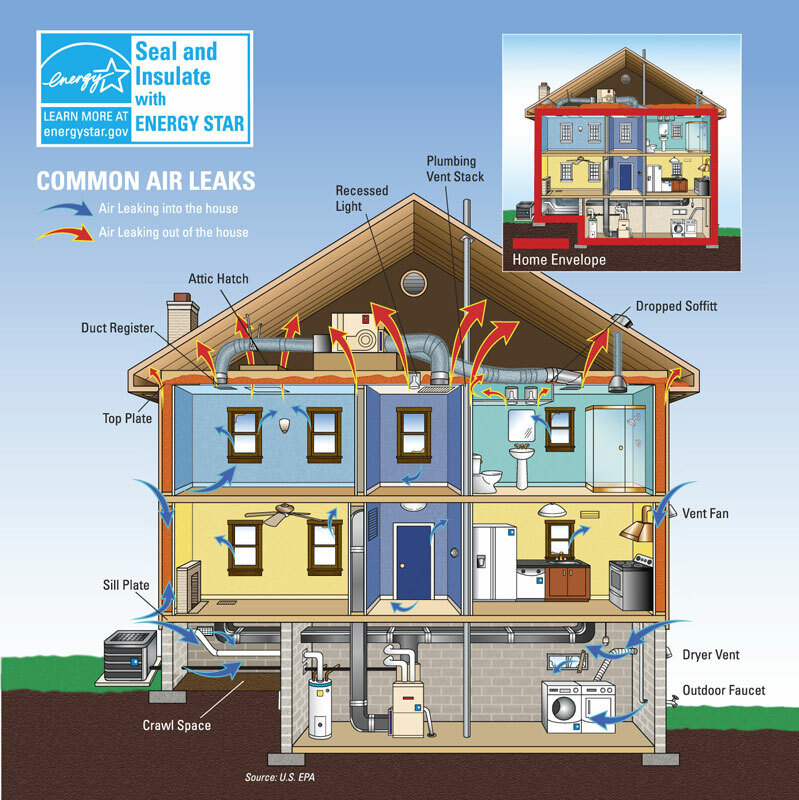 A great deal of thermal energy is lost through the ducts in a home’s central HVAC system. When cooling your house with ducts, the cool air will be warmed by the hotter air outside the ducts as it moves around your home. Even ducts that are heavily insulated will let some of that cooled air escape into the surrounding space. That means that with a central AC unit, a great deal of cooled air is lost to exterior walls and other non-essential areas of the house. Ductless AC units, on the other hand, deliver heat right where it’s needed. No cool air is lost with ductless air conditioning because there are no ducts to worry about—instead, the system kicks on and heat floods into the space right away. Unlike a conventional HVAC system that uses one thermostat to control temperature for the whole house, each unit in a ductless system has its own thermostat. This allows unique temperature settings in each room that has a ductless AC unit, which translates to greater efficiency and often reduced utility bills. Energy efficiency—look for units with an Energy Star rating. Since there’s no ductwork, installation costs are generally lower than central HVAC systems. Installation is generally less disruptive to your existing home because it doesn’t require the same physical space as ducts. Ductless split systems offer flexibility when installing indoor air outlets as they can mount against the wall, flush against the ceiling, or recessed into the ceiling. Ductless multi-split air conditioning system outlets are designed to blend in with the décor with a variety of colors and styles available. Multi-zone systems also have the advantage of using two to five air outlets allowing an individual air outlet to be placed in multiple rooms. Each air outlet comes with its own thermostat for individual room control. Ductless systems allow you to reclaim closet space or even have higher ceilings since you don’t need to leave room for ducts. A certified ductless AC installer is required to install a ductless air conditioning system to ensure lines, cable, valve, and drainage are installed correctly and functioning properly. Get bids from a professional now above with the GET FREE QUOTES button. Ductless Split AC system: The split system has three main parts. The compressor which is located outside, the inside air outlet (air handler) and a remote control. The compressor and the inside air outlet can be placed up to 50 feet apart and still function properly. Additional materials used for installation include copper tubing that connects the outside and inside unit. The tubing carries the necessary refrigerant to operate the system. A plumbing connection is also necessary to drain the condensation accumulated by the system. A line can be piped into an indirect drain in the home such as the one used for a washing machine or a dedicated drain may be used to redirect the condensate. Multi-split Ductless AC system: The multi-split uses the same equipment as the split system with the exception of having only one air outlet. Multi systems can have up to five air outlets. It takes more copper tubing and wiring for the multi-split system since each air outlet is connected independently to the compressor. Protect Your Investment. Contact a licensed HVAC contractor to assess your usage and to size your ductless mini split system appropriately and according to your home’s layout. Before hiring an HVAC contractor, ask for a written estimate and copies of their HVAC license and insurance coverage. Since most municipalities require HVAC contractors to carry a valid heating and air conditioning license as well as liability and worker’s compensation insurance, you would be wise to verify their credentials before signing on the dotted line. Check with your local building department or attorney general’s office to verify their contractor license. Contact the applicable insurance companies to verify they hold the required insurance coverage. In addition, visit the BBB or Better Business Bureau website to search for recent complaints or legal action against said contractor or company. Look for an ENERGY STAR rating. Energy Start ductless HVAC systems have been tested and passed the rigid standards set by the Environmental Protection Agency and the U.S. Department of Energy. Check for a high Energy Efficiency Rating (EER) and Seasonal Energy Efficiency Rating (SEER) A higher rating will increase the cost of the ductless AC system, but will pay for itself in time, since the unit will cost less to operate. Check for BTUs: When you’re shopping for units, you’ll notice mention of BTUs. It stands for British Thermal Units, a unit of power. The bigger your room, the more BTUs you need to keep it cool. Use an online BTU calculator or chart to estimate your needs based on the square footage of each room. For example, a 150-square foot room needs up to 5000 BTUs. A 500-square foot room needs 10,000 BTUs, and a 1,960-square foot room needs 28,500 BTUs. For informational purposes, a 22,000 BTU 2-ton ductless mini-split system runs on 230 volts; it has a high seasonal energy efficiency rating (SEER) of 15, which results in quality energy efficiency, and it can cover up to 1500 square feet. Regularly clean and replace the filter: This allows the system to keep the air purified and will help prevent system breakdowns. To maintain optimal airflow to the compressor, you’ll need to keep plants, tall grass, and debris away from the unit.